The Bensman Group has a very active Outreach Program, and its most recent effort helped to feed hungry children around the world. 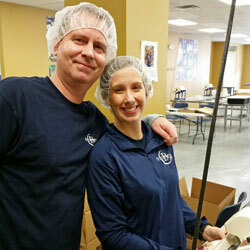 A group of 12 Bensman employees recently volunteered at the Libertyville, Illinois, location of Feed My Starving Children, a Christian non-profit that creates specially designed food packets that are made to meet the nutritional needs of severely malnourished children in underdeveloped parts of the world. The Bensman volunteers packed enough of these special meals to feed about 36 children for a full year. Participating from Bensman were Doug Ackerman, Managing Director; Michael Collins, Director-Individual Insurance; Joel Feiger, President and COO; Melissa Howard, Registered Field Assistant; Jill Larsen, Operations Manager-Individual Insurance; Amy Meyer, Senior Operations Manager; Rob Terranova, Personal Lines Manager-Individual Property and Casualty; Taylor Weismann, Client Support Specialist-Individual Property and Casualty; Catrina Wickman, Personal Lines Manager-Individual Property and Casualty; Linda Wieczorek, Portfolio Manager; and William Woller, Personal Lines Manager-Individual Property and Casualty. Amy Meyer heads Community Outreach at Bensman. She says that her colleagues have a strong desire to help the less fortunate. Other outreach efforts include the firm’s annual holiday time visit to the Northern Illinois Food Bank warehouse in Park City, Illinois, as well as helping out at the Lake Forest Library book sale, a local Letters to Santa program, and Bernie’s Book Bank in Lake Bluff, Illinois, which collects and distributes books to underprivileged children.